A wellness-centered model for senior housing has started to become the industry standard, and providers are embracing hot technologies such as wearables and voice-activated devices to meet the goals of this new approach. Increasingly, the heart of senior housing communities could be the Center for Healthy Living (CHL), according to Claire Dickey, an associate at architecture firm Perkins Eastman, which recently put out a report on CHLs. The CHL model has arisen to support the concept of “whole-person wellness,” as many senior living providers are seeking to nurture residents’ wellness across physical, social, spiritual, emotional, occupational and other dimensions. Some senior living communities build standalone CHLs while others have more decentralized models, with spaces throughout a campus to support the facets of wellness. These spaces might include a fitness center and pool, a spa/salon, a clinic, an art studio, classrooms, and more. The “technology center” is another potential component; this is not an old-fashioned computer lab, but could be a place for companies such as Google or Philips to to test new tech, or it could even be a “virtual reality studio,” the Perkins Eastman white paper notes. However, technology in a CHL extends far beyond a single room. Senior living providers are installing and utilizing tech in innovative ways throughout CHLs. 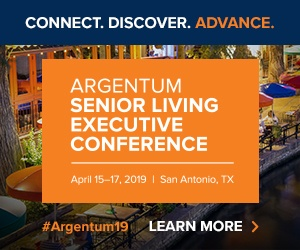 A few of the communities studied by Perkins Eastman, as well as a new operating company that has embraced the Center for Healthy Living concept, recently spoke with Senior Housing News about the evolving role of tech. These providers agreed that technology should foster engagement and needs to be flexible, to serve a variety of different user types. The fitness center and clinic are key components of most CHLs, given the importance of physical health in maintaining overall wellness. Within these settings, technology—particularly wearable activity trackers such as Fitbits—could help people create and stick with personalized health and fitness plans. That’s the goal at Ingleside, a nonprofit that operates three continuing care retirement communities (CCRCs) in the Washington, D.C., area. Two of them, Ingleside at Rock Creek and Ingleside at King Farm, are undergoing expansions right now that include construction of CHLs, which should support residents becoming even more engaged in improving and maintaining their own health and wellness, Chief Information Officer Dusanka Delovska-Trajkova told SHN. Ingleside currently is working on a resident website that would communicate with wearable devices. This could facilitate “health competitions.” Residents could, say, track the number of steps they take and see where they stack up against others. The website also could be used to provide doctors, physical therapists, and trainers with health data. Another believer in wearables is Vitality Senior Living CEO Chris Guay, who is leading the new Nashville-based operator. As Vitality develops its first communities and renovates those it acquires, it is embracing the CHL model, Guay said. He too emphasized how Centers for Healthy Living can increase engagement. In the fitness center at Rockwood South Hill—a CCRC in Spokane, Washington—engagement is created through a different sort of technology. While engagement in the physical facet of wellness is important, the idea of a CHL is to be a sort of one-stop shop for whole-person wellness, which goes beyond the physical. To address these other dimensions of wellness, the CHL at Ingleside will include spaces such as a meditation room and classrooms. Tech can play a big role in these areas, too, said Delovska-Trajkova. One good example of this can be found at St. John’s on the Lake, a CCRC in Milwaukee, Wisconsin. The community has partnered with a service that offers virtual field trips. Residents gather in a common space and tune in via the internet for a live tour of a particular site, such as Franklin Roosevelt’s home in Hyde Park, New York. Another fundamental aspect of CHLs: they often are meant to be used by a wide variety of people. Not only do they welcome seniors at all different points in the care continuum, but they might also be positioned to be used by people of all ages who don’t live in the senior housing community. For instance, Vitality is aiming for a “retail feel” at some of its locations, with hopes to draw people to its gyms, spas, restaurants, and learning centers—it’s even considering a day care for children. From a tech perspective, flexibility therefore becomes a must. Voice-activated technologies such as the Amazon Echo could work well, because this is something that’s easy to use by every age group and nearly every level of functioning. Vitality also is piloting voice-activated tech. St. John’s on the Lake uses the It’s Never 2 Late (iN2L) product, which is an interface that includes a variety of programs such as puzzles and quizzes, karaoke-style hymns and other spiritual content, exercise videos, and specially curated movies and television programs. These programs are tailored for different types of users based on cognitive abilities and other factors, and iN2L works well because it’s flexible in this way, Spars said. In terms of catering to clientele from the general public, CHLs need to accommodate a range of different consumer technologies. Ingleside is striving to be device-agnostic, so that any wearable device can be used, not just the Fitbit brand. “We don’t limit people’s choices, we try to work around their choices,” said Delovska-Trajkova. Another factor to potentially consider is that senior housing-specific technologies such as wander management may need to be extended to CHLs as well, but these can’t compromise the CHL experience for non-residents. So, anything involving loud alarms should be avoided. The approach at Ingleside goes back to engagement; the plan is for memory care residents at the CHL to be engaged in meaningful activities that naturally prevent agitation and roaming. Another part of flexibility is being able to incorporate new tech as it emerges. Senior living has earned a reputation, rightly or wrongly, for being slow at tech adoption. That might have to change, with the CHL template attracting the general public into senior living communities at the same time that tech-savvy Baby Boomers become residents. “On the tech piece, as business executives, we need to keep our pulse on emerging trends and avoid disappointing customers and falling behind competitors,” said Delovska-Trajkova.